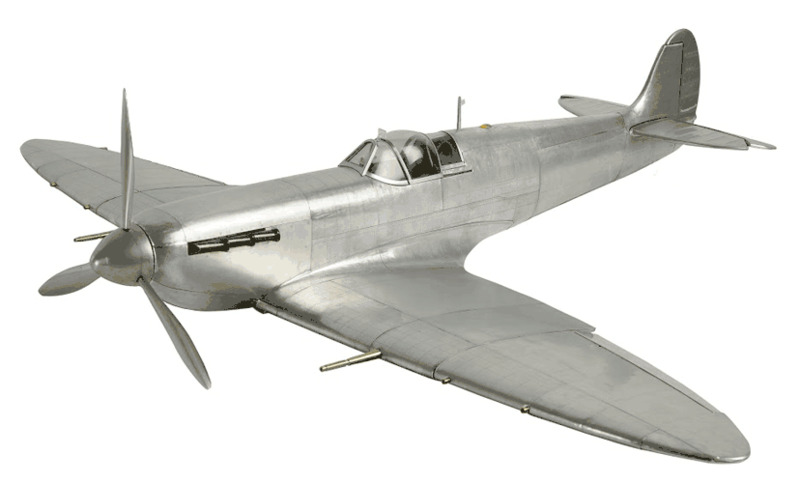 Model Airplanes – This Spitfire Metal Model Aircraft is a replica of the Spitfire fighter plane manufactured by Supermarine Aviation works. The legendary Spitfire was designed by R.J. Mitchell and it was built as a short-range, single-seat, interceptor aircraft. Mr. Mitchell fashioned the aircraft with a unique elliptical wing. With a thinner wing, this allowed the Spitfire, mainly flown by the Royal Air Force, to fly faster with more maneuverability which was critical when battling the Luftwaffe. Our replica Spitfire model is carefully constructed with a lightweight frame which is then enclosed with flat sheet metal. An interesting facet of the metal sheet is that is looks like individual rivets are used to connect the metal, like a real aircraft. The Spitfire also have functioning ailerons and tail rudder. Depending upon how you wish this model displayed, the landing gear may be extended or retracted. 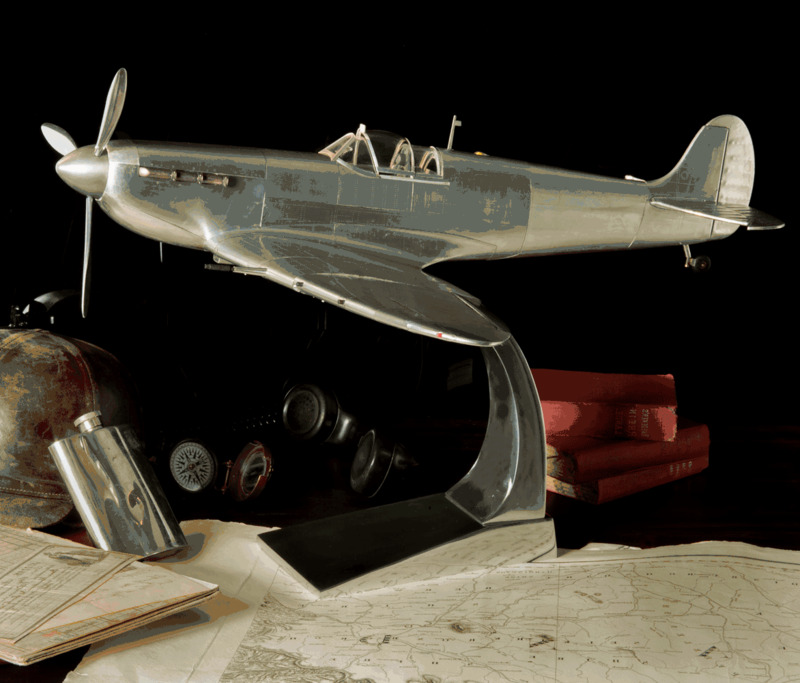 It is the Spitfire cockpit that really makes this model such a great museum quality collectible piece. 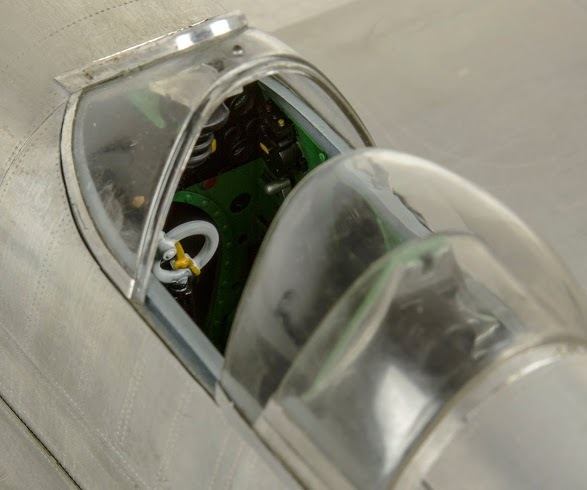 The slide-back canopy displays a fully detailed cockpit including pilot seat, instrument panel, and controls. This fully assembled model plane also arrives with a metal base. Well crafted plane. Beautiful replica made with aluminum. Whilst based on the original Spitfire, this model incorporates features not seen until the 1941 Mark 9 Spitfire (the ultimate Spitfire). All Spitfire enthusiasts should be well satisfied with this.